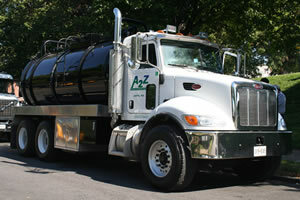 A2Z works closely with both contractors and owner/operators to provide both the recovery and transfer of uncontaminated free product or the transportation and disposal of contaminated product, intruded ground water, sludge and deposits, or similar wastes through a wide range of collection scenarios. The Company can provide its services on an hourly rate basis that encompasses both truck and operator or a lump sum cost proposal by job so that total costs are known in advance. Either way, A2Z will work hard to provide the most competitive pricing possible. Baltimore County Public Schools, Potomac Environmental, Philip Services, Verizon, G&K Services, Miller Environmental and La-farge are only a few of our many customers. Working with tank removal contractors to pump down tanks prior to being removed or abandoned in place. Working with cleaning contractors to vacuum out sludge and deposits from tank bottoms during cleaning operations. Working with site-work contractors to clean up oil, fuel and hydraulic fluid spills resulting from refueling, lube truck operations or construction equipment breakdowns. Working with site work or remediation contractors to clean out accumulated silt from storm drain systems and out falls. Working with remediation contractors to clean out storm management ponds and impoundments. Transfer clean product from one tank or vessel to another. Pump down tanks or vessels prior to cleaning, change in service or closure. Work with in-house cleaning crews to vacuum out sludge and deposits from tank bottoms during cleaning operations. Serve as a temporary holding tank during cleaning or repair operations. Pump off contaminated waste from retention ponds, surface impoundments, lagoons, etc. Regularly scheduled pick-ups from holding tanks, storage basins, oil/water separators, scrubbers, and similar items that require routine servicing.